When I used to go on holiday, a quarter of my suitcase used to consist of books. And that’s not even counting my backpack! Hellooo? Isn’t this the 21st century? Yes, we live in a time where everything needs to be smaller and more compact. And if you can put hundreds of CDs into one small music box, then why not make one compact library containing thousands of books? I’ve been a bookworm for as long as I can remember. As soon as they taught us to read when I was six, I stopped waiting for my parents to read me bedtime stories. I took the book of the shelf myself. When I discovered the concept of the public library, this is where you could find me every day after school. The librarians greeted me by name. I read everything there was to find. Today, I still love the smell of a new book. When I was in high school, I was reading 70 books on average per year. So can you imagine how many books I must have carried when traveling! I read fast and on holiday you have loads of free time to spend in story worlds. I was struggling, though: how many clothes would I have to leave behind to be able to bring two extra books? Even though I love the smell of books and the feel of turning a page and the view of seeing them all next to each other on the shelf, I have to admit the arrival of the E-reader came as a relief to me. 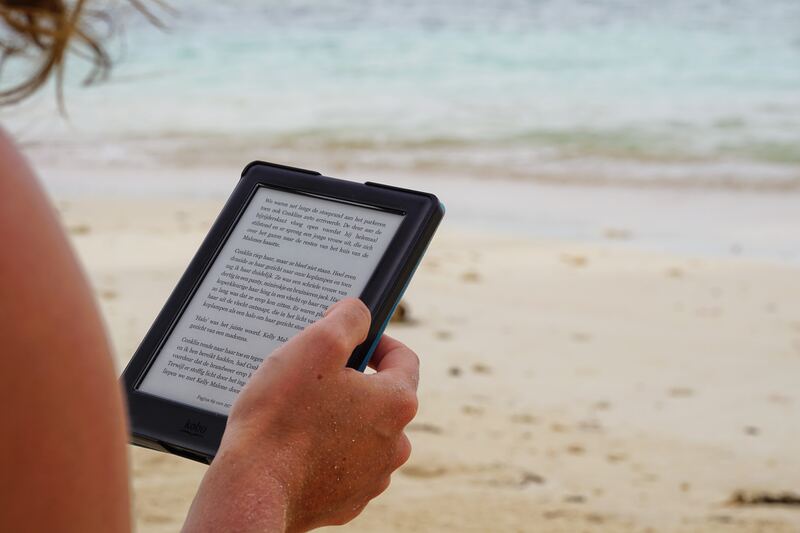 It’s compact, light-weight and the ebooks are readable in both dark and sunny environments. Nevertheless, I took me some time to wrap my head around the fact that I’d be reading books that aren’t… well, books, but it was honestly the best solution for someone who devours stories at a rate like mine. In the end, I would only be using the E-reader when traveling. After all, you can still read “real” books at home, and ebooks on the road. It’s just an amazing travel hack, an E-reader! Then came the subject of selecting the right E-reader for my needs. Here’s an overview of the reasons why I decided to go for the Kobo Glo! My E-reader is turning 4 this year, so for newer models you can take a look on Kobo’s site. I bought mine with a nice cover in physical Fnac store, but you can also order on Coolblue, Bol.com or Vandenborre – whichever you prefer. The Kobo Glo can be used intensely for about three weeks or during “normal” use for a month or more without needing a recharge. The screen of an E-reader looks like a real page from a printed book. It takes some getting used to, but it’s amazing! I’ve read my Kobo by the pool in San Pedro or at the beach in Barcelona and was always able to read without difficulties. Even better, as some books can painfully reflect the sun! The Kobo Glo was the first model that has inward lighting that is soft on the eyes and doesn’t disturb the people around you. The Kobo Glo can hold hundreds of books at once, as well as magazines, newspapers… Just activate your subscription to access your favorite newspaper! You can easily adjust the settings of the E-reader, including the brightness. There’s a Wi-Fi feature to synchronize the books from your computer with your device, all wireless. One of the biggest benefits of the Kobo brand, in my opinion, is that you can open almost all formats of eBooks (except Amazon’s mobi-files). Also, you’ll find eBooks in all languages, not just English. If you do read books in your not native language, you shouldn’t worry: there’s a dictionary included in the Kobo Glo. You just hold the word you don’t understand and the explanation pops up. This doesn’t work with PDF-files though. I personally never ever write in books. I never fold page corners. In short, I try to have my books look like new for as long as possible. However, in my eBooks, I note and fold as much as I feel like. You can undo it anyway J What you can’t do is color-mark things because the screen is black-and-white. The Kobo Glo remembers which books you’re reading and how many hours and days you’ve spent on the device. Kobo also suggests books and new publications based on what you’ve been reading. Nifty little thing, isn’t it? There’s also an app for Android and iOS that smoothly synchronizes with your E-reader and desktop program (delivered with your device). Wherever you decide to buy an eBook, it will synchronize with all your devices once they are connected to the internet. If you sign up to their mailing list, Kobo also sends promotions and offers to your mailbox. Finally! A device with touchscreen that doesn’t show fingerprints. Now, if that isn’t the best benefit of this whole list. I bought my Kobo Glo in 2014 at Fnac for €139 (excl. cover) and it still works quite well. Check out http://www.kobo.com for all the newest models! Do I dare ask… Have you made the step to switch to an E-reader yet?